Group therapy is one of the major components of treatment at Adolescent Growth and Linnea conducts sessions that are interesting, insightful and fun. She is adept at helping teens in group gain insight into their past behaviors as well as learn new tools for making better decisions moving forward. Linnea’s main goal in groups is to help clients realize their full potential and develop a clear understanding of who they are and who they want to become. Academically, Linnea attended Northeastern Illinois University where she received a Bachelor of Arts Degree in Media, Communications, and Theater. She also holds a Master of Arts Degree specializing in Clinical Psychology from the illustrious Wheaton College. Linnea is currently completing a certification program in Drama Therapy. Professionally, Linnea was an intern at Judson University in the counseling center and has over ten years of experience working with adolescents as an educator and mentor. Linnea is passionate about bringing her experience in the arts into her clinical work. 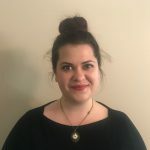 She is thrilled to be in a position where she can continue to work with adolescents and where she can be a part of a team that is dedicated to healing families. When not at work, Linnea enjoys sewing, collecting small antiques/oddities, and watching BBC mini-series.